The Daino estate vineyard lies about 20 km south of Caltagirone, near the Bosco di Santo Pietro woods. It occupies over 6,500 hectares in a setting of natural beauty and is tended using ancient techniques handed down by skilled wine makers over the centuries. Cultivation of the Nero d’Avola, Frappato and Alicante varieties produces Suber, a wine with a distinctive, intense taste, while the name comes from the majestic specimens of Quercus Suber (cork oak) which populate the woods. On the Daino estate i Vigneri Staff specialised in bush training tend the vines by hand in every growing stage taking care to protect the environment and work in harmony with the land. The vines are supported by chestnut wood stakes while the shoots are tied with biodegradable, environmentally friendly twine made from pampas grass (Cortaderia Jubata), which grows spontaneously at the margins of the vineyard. 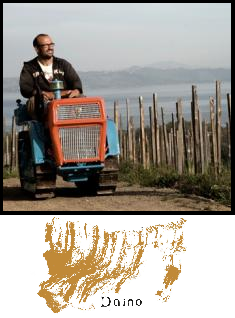 The Daino estate cultivates its vineyard using traditional techniques, at the same time protecting the environment and nurturing the natural development of the plant and fruit. The various stages of cultivation are carried out manually: from the design and layout of the vineyard to the subsequent stages of cultivation each vine is personally tended with care and attention. Vine pruning follows the phases of the moon and is done with secateurs made, as in times gone by, by local craftsmen. The surface roots are cut forcing the rooting system to grown down deeper. Emphasis is also placed on so-called “green pruning” to curb excessive growth during the summer and to contain the foliage. Natural, organic fertilisers (sheep and horse manure) keep the soil well supplied with nutrients, in accordance organic farming standards. The soil around every plant is hoed manually and the ground is worked with the help of a mule. The phase of preparation for the harvest requires careful, constant monitoring of the state of maturation of the grape: in fact, from mid-August onwards the sugar content of the grapes is measured every week. Only once it has been ascertained that the optimal level of ripeness has been reached does the harvest begin. It is carried out strictly by hand in a single day taking care not to damage the fruit and not to exceed a given number of bunches per box, so that the crop is healthy, a necessary prerequisite for a quality wine.